These one-of-a-kind leather hats are made in Cotacachi, Ecuador. Attached to the hat ribbon's ends are real rattles from Western Diamond Back rattlesnakes from South Texas. What is so cool about these hats is that when you walk you can hear the rattles rattling! 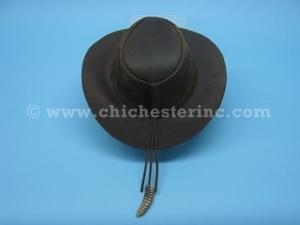 We use large rattles, which have nine to eleven buttons and measure 2" to 2.25" long, and extra-large rattles, which have twelve to thirteen buttons and measure 2.25" to 2.75" long, to make these hats. We measure the inside circumference of the hats in inches. Sizes are approximate. The diameter of the outside brim from front to back is about 14" to 15", and from ear to ear is about 12" to 13". To give you an idea of the size, a 23" circumference hat measured 15" long by 12" wide with a 12.5" long strap, and it weighed 0.56 pounds. For more information about headwear sizes, click HERE. Genus and species of cow: Bos taurus. Ranch. Genus and species of rattlesnake: Crotalus atrox. Wild. Not for sale in Oregon. Cows and rattlesnakes are not not subject to CITES controls.